What a downer to know a thing is good, but you can't see it. 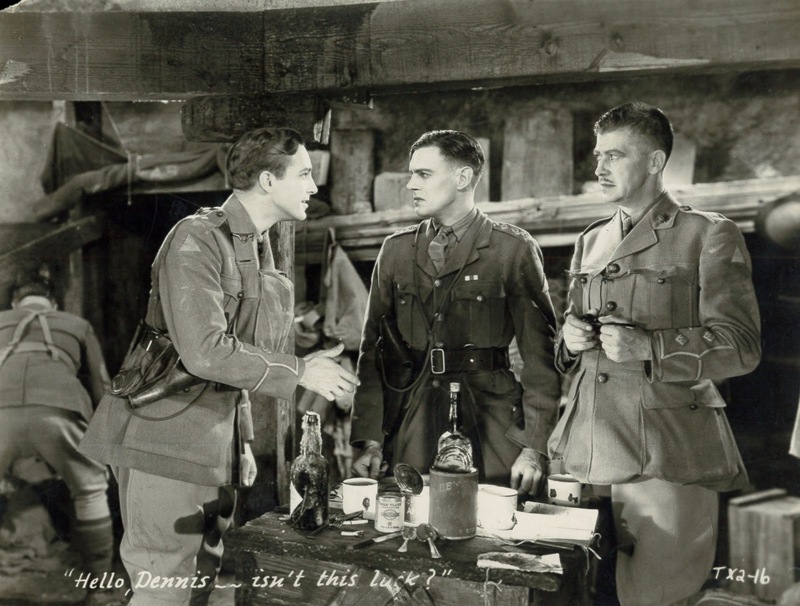 Journey's End is owned by who-I-don't-know, produced by a company that folded before Prohibition quit. Anyone interested in The Great War should see it, but most won't, and likely never will based on phantom status. There's also issue of length, a long version intended, plus cut ones that misrepresent Journey's End where it has too seldom resurfaced. I was slipped a bootleg that was thankfully intact, but search me as to whether anyone could care enough to fix Journey's End and put it on Blu-ray. Bigger gorilla that was All Quiet On The Western Front took bulk of 1930 laurels, few of even harder core buffs having seen both. I needed two looks at Journey's End to get full into trench-set eyeball of a Lost Generation in the making, and admit to wanting to watch firstly because James Whale directed and Colin Clive starred. That's two endorsements, and frankly enough to justify the sit even if Journey's End weren't special otherwise, but here's the save, it is. 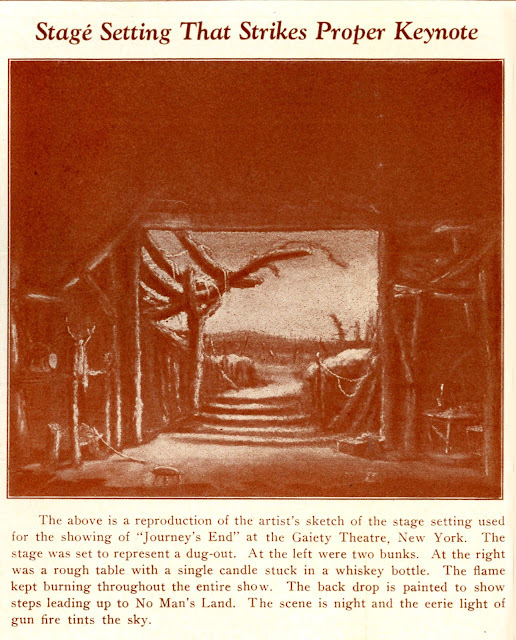 Journey's End had been a play in England, its writer (R.C. Sherriff) having waded war's mud and blood for real. Viewers felt the authenticity, those who had served saying Journey's End was just what they suffered. Word-of-mouth made attendance an almost religious experience. There had been WWI plays, but none so far to capture the hell so vividly. 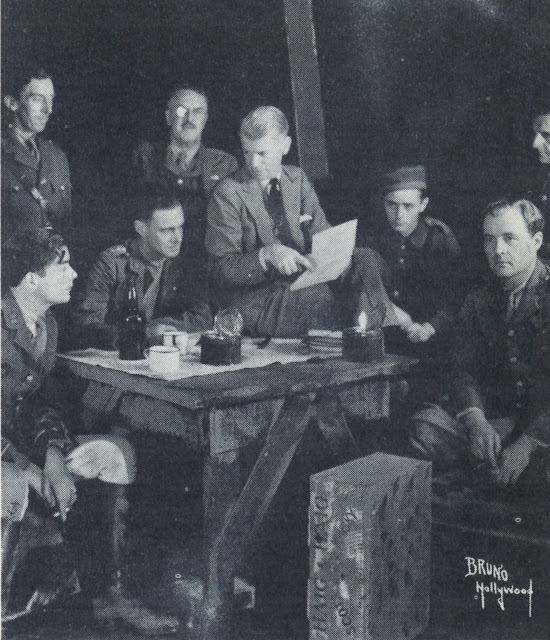 We know men of the second war were reluctant to discuss what they'd seen, and may assume their elders from the first round were even more reticent. Many saw Journey's End through tears. It either resolved a lot of PTSD, or awakened it. England took Journey's End most of all to heart because that country felt more of Allied loss. No man of sufficient age was untouched, ones who saw Journey's End balanced by those who'd stay away for fear they couldn't relive the experience w/o hazard. This, then, was something beyond casual theatre-going. 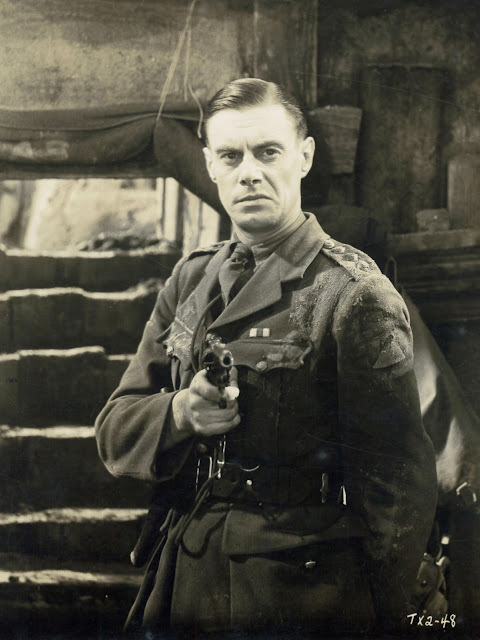 Had James Whale not been taken up by children who'd love his later horror films, he would be best remembered for Journey's End, a property JW saw through live staging in both the UK and US, then for this first feature he would direct. The story is of men living in a hole. They can only go out to face Germans, or have the Germans pour in. Journey's End as a play is ideal for such confinement, for how many of trenches offered more space than a stage? Advantage served by live performance might be lost in translation to screens, where movement was a must, even in earliest talkies for which a single set was anathema. Here was where James Whale could prove himself equal to the challenge that filming posed, keeping values of a successful play from fate suffered by nascent tries at adaptation by others. James Whale had an instinct for stage-screen translation right from his start. Waterloo Bridge and Frankenstein were a next two after Journey's End, and look at assurance of both. We're lately reminded of his skills by 2017's reemergence of The Old Dark House, so there are Blu-Rays now of all Whale chillers. A director's status can rest on preservation/availability of work, and for James Whale at least, there has been much progress. TCM runs Showboat now in HD, and their lease of One More River continues. A Kiss Before The Mirror languishes on substandard DVD, a Universal "On-Demand" that demands more their willingness to re-master it, so far not done. A fix and revival for Journey's End would be a welcome step closer to exalted place this director deserves. This movie really does need to be restored. Ideally, there should be a box set of Whale's Great War Trilogy; Hells Angels, Journey's End and Waterloo Bridge. Appearing in the cast besides David Manners and Clive is Anthony Bushell as the frightened officer. This actor would later play a similar role in the TV version of Quartermass and the Pit. Another interesting point comes at the very end of the movie, as the camera holds for a very long time before the credits on the collapsed bunker, with the dust hanging in the air. I've wondered if this is a recall of how the stage play ended? Did they collapse the set and pour tons of dirt on the stage? So much that it would fly out coating the audience? Would they even close the curtain? Just leave the caved in set for the dust covered audience to just get up and leave on their own? A curtain call would undercut the dramatic impact of the fate of the characters and the point of the play? I haven't watched my bootleg copy in at least a decade, and now feel like digging it out. I remember feeling a little letdown, perhaps its reputation being impossible to live up to. 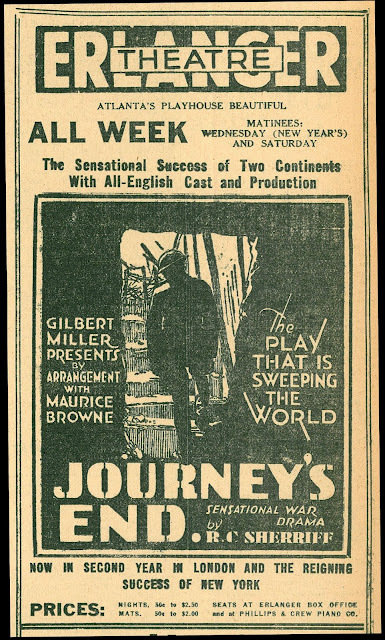 The stage version of "Journey's End" was revived here in New York some years ago, but as I recall the reviews tended to be mixed at best, so I wound up skipping it. Some plays just don't age well. 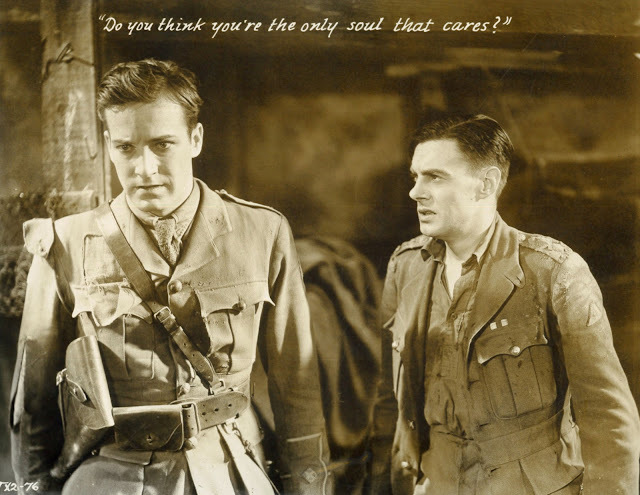 I caught the revivals of "Machinal" (Clark Gable's first Broadway appearance in 1928) and "The Big Knife". I could tell why they were considered groundbreaking at the time, but it didn't prevent them from being disappointing today. The latter was even laughable. I'm sorry to hear that this film is so MIA. I would really like to see a good copy. 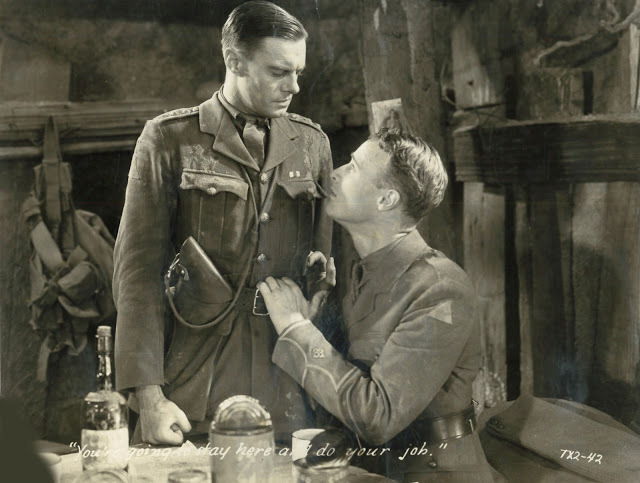 The 1931 film of Eric Maria Remarque’s “All Quiet on the Western Front” suggests the privations that German troops endured. At that, the Germans had retreated to higher ground of their own choosing after the Battle of the Marne. Their trenches and dugouts were well-constructed, often reinforced, and dry. Some had electric lighting. In contrast, the British occupied the lower ground of the Marne River Valley. Their trenches and dugouts were less well-constructed or systematic than those of the Germans, often wet even when it was not raining constantly, as in the spring and winter, and infested with vermin to a greater extent. In particular, the rats were well fed for the abundance of food available to them. As to latter, one must consider the casualties sustained during the Battle of the Somme. On July 1, 1916, after a five-day artillery bombardment in which 1.5 million shells were fired, the British attacked the German lines across a wide front. The bombardment had torn up the open ground across which the British troops would move, making it difficult to sustain more than a walking pace, but had done little to lessen German resistance. On that first day, there were 57,470 British and 2,000 French casualties, against 10,000 German casualties. The British had gained three square miles of territory. By the middle of November, when the Germans retreated to the prepared emplacements known as the “Hindenburg Line,” the British and French had advanced seven miles across a 30-mile front, at a cost of 419,654 British and 204,253 French casualties. The Germans suffered 445,322 to 465,000 casualties.Deaths accounted for around 23 percent of the casualties. Several truces were called to allow the bodies of the dead to be recovered, but many and perhaps most remained on the battlefield. Subsequent bombardments would churn up the ground and the rotting bodies that had become part of it. Thus, the health of the rats and the conditions R. C. Sherriff wrote of. There's a decent copy of Journey's End available from The Movie Detective.